Worldwide Pension Administration Applications Market to reach $90 billion by 2022, compared with $73 millions in 2017 at a compound annual growth rate of 4.3%. In 2017, the top 10 HCM software vendors in the Pension Administration market segment accounted for nearly 90% of the global Pension Administration applications market which approached nearly $73 million in license, maintenance and subscription revenues. 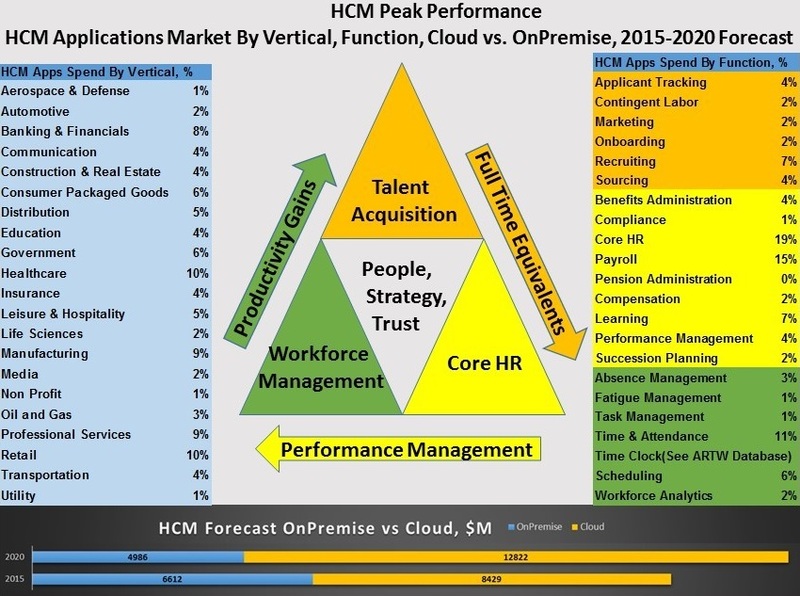 The Pension Administration Market Segment is part of the Core HR and Performance Management product group. Last year Aquila led the pack with a 41% market share followed by Oracle, SAP, Raet, a Visma Group Company and DATEV. Note: Our Pension Administration Market Report is work in progress. An update to the Report is being cooked, additional vendors and market leaders will be included such as: Sagitec Solutions, Vitech Systems Group, Lynchval, Morneau Shepell, Exaxe, Koger Inc., Morneau Shepell’s Ariel, ITM PenScope, LRS Retirement Solutions, Milliman MARC, Profund P3, Equiniti CompendiaTouch and others. These top 10 vendors are ranked by their latest annual product revenues attributable to Pension Administration market segment. Check the methodology section below as well as our FAQ section on how we conduct research for these market reports. 1 Aquila Subscribe Subscribe 3.8% Subscribe In August 2018, The Scottish Public Pensions Agency (SPPA) is extended its partnership with Aquila Heywood, to provide an integrated IT software solution for its Pensions Administration, Payroll and Digital Services. SPPA administers the pensions across four schemes covering Teachers, NHS, Police and Fire schemes delivering Scottish Government front-line services to over 550,000 active, deferred and pensioner scheme members, as well as 1,250 employers. Together, Aquila Heywood and the Agency will work on their award-winning platform, Altair™, to build enhanced digital facilities to provide a faster and more efficient service to members, employers, and beneficiaries. 2 Oracle Subscribe Subscribe 4.2% Subscribe Oracle recently unveiled a bevy of new products and initiatives for its Infrastructure As A Service and Platform As A Service offerings. Two things stand out with the IaaS and PaaS announcements. First, Oracle’s IaaS strategy rests with building the data center of the future with a host of services and technologies that piggy back on its Autonomous Database, which will become generally available in 2018. Second, such an extension will help facilitate the enterprise lift and shift that is underway for Oracle customers to redistribute their workloads, again outsourcing both Oracle and non-Oracle workloads that encompass an assortment of databases, applications along with emerging technologies like Blockchain, chatbots, Internet of Things as well as the interplay between physical assets and virtual replicas in what Oracle calls it Digital Twin. 3 SAP Subscribe Subscribe 12.9% Subscribe Number of SAP SuccessFactors Employee Central customers for Cloud Core HR applications exceeded 2,400 in 1Q18, up from 1,100 in 1Q16. Additionally, In 2018, SAP introduced a new sales, audit and pricing model for its Digital Access licensing policies addressing long-standing issues relating to how users should pay for indirect access to SAP software. 4 Raet, a Visma Group Company Subscribe Subscribe 3.3% Subscribe In July 2018, Visma Group acquired Raet. Visma has acquired 100 percent of the shares of Raet. Combined, Raet and the Visma Group are now Europe’s leading cloud company specialised in the development of solutions that are critical for small, medium and large business and enterprises, both private and public. Raet and Visma combined consisted of 3,000 developers, who are all dedicated to creating customer value through new technology such as algorithms, optimisation, machine learning and AI. There is no limit to what we can achieve with the right people and technology. 5 DATEV Subscribe Subscribe 4.8% Subscribe The paperless office made possible thanks to the DATEV digitalization of business processes. 6 UNIT4 Subscribe Subscribe 14.3% Subscribe Unit4 offers a range of HCM solutions providing comprehensive support for HR, Payroll and people planning. Recent developments include Unit4 Business World On! – integrated core HR, payroll, people planning, training administration and salary packages at the heart of your ERP; Unit4 Absence Manager – a single, cloud-based solution to record, monitor and manage illness-related absence; Unit4 People Planning – the user-friendly tools and visibility to ensure the right people are on the right project at the right time; and Unit4 Travel & Expenses – a complete, cloud-based self driving solution for faster, easier and more reliable expense claim submission and processing. 7 Visma Subscribe Subscribe 10.0% Subscribe Visma has acquired 100 percent of the shares of Raet. Combined, Raet and the Visma Group are now Europe’s leading cloud company specialised in the development of solutions that are critical for small, medium and large business and enterprises, both private and public. The acquisition is mutually beneficial and provides growth opportunities by leveraging the synergies between Raet’s current offering and Visma’s overall HRM strategy. This will provide great benefits to customers and employees as the combination brings strategic future initiatives to fruition more quickly and efficiently. The combination of Visma and Raet will lead to an even stronger focus on offering relevant solutions to the market. 8 Version Systems Private Limited Subscribe Subscribe 16.7% Subscribe FactoHR is leader in workforce benefit platform which covers automated systems of Human Resource Management, Retirement Benefits, Payroll, Leave, Attendance, Expense, Reimbursement, Performance and all types of statutory compliance. 9 Malam Payroll Ltd. Subscribe Subscribe 37.5% Subscribe Malam Payroll development, allows managing all human resources components – salary, attendance and human resources – adapted to your organization’s needs and from one data base. The system provides integrative solutions through advanced Oracle-based technology. 10 SYNEL MLL PayWay Ltd. Subscribe Subscribe 0.0% Subscribe From 2006 to 2010 Synel made a lot of acquisitions, among them are acquisition of MLL PayWay Ltd, acquisition of 50% of Ferox, Time America Inc, Anteco and SRL’s Schedule Master. Synel nas subsidiaries in the US, UK, France and Sweden, front offices in North America and China and approximately 60 distributors in over 50 Countries.